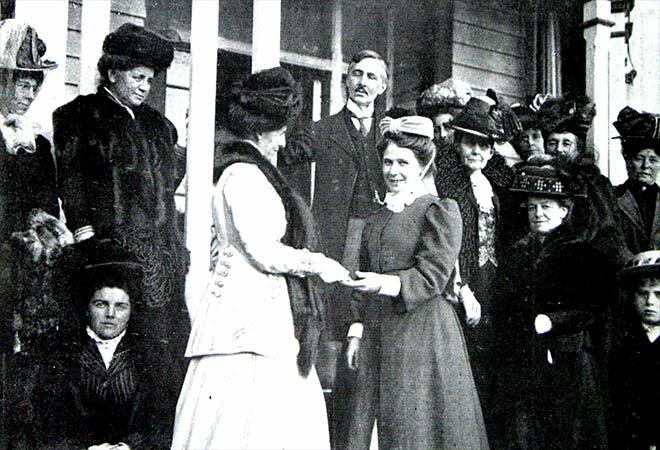 Joanna Murray (formerly MacKinnon) is presented with her Plunket medal by Lady Plunket in Dunedin in August 1909. Frederic Truby King, founder of the Plunket Society, looks on in the background. Usually Plunket nurses were required to surrender the medal if they married or moved to another job, but because of her important contribution to the establishment of Plunket nursing, Joanna Murray was given her medal permanently.